This is the first stage (first phase of footfall) of gait for several confusing gaits (first stage being the set down of the right hind hoof). Compare and see if you can tell which is which .. remember to look at angles of legs as well as support etc. While all of the pictures look similar, the relationship of the legs to one another and the slight differences will let us know which gait it is. #1 Paso llano, #2 Runwalk /flatwalk, #3 saddle rack, #4 stepping pace, and #5 foxtrot. Photo 1: I think this one has already been identified as a paso llano, right? Photo 2: I think this is a running walk, because the front near leg is straight up and down when the rear near leg is at it's furthest back point. Photo 3 and 4: The angles of the legs in both pics look the same to me, but the head and neck positions are very different. Also, the far front leg in pic 3 is lifted much higher than the same leg in pic 4. So my guess is saddle rack in pic 3 and stepping pace in pic 4. And I'm probably wrong on all counts, but this is fun, and I think I am learning something, albeit very slowly (grins). 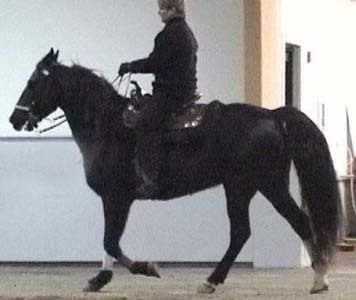 What makes the difference between his gait and the gait of the pinto is the timing that is connected with the position of the front non supporting hoof. The sorrel is going to hit the ground a lot faster than the pinto is with that hoof, following the set down of the hind much more closely.